Tina has been employed with us since 2014. 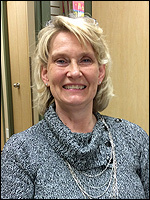 She enjoys travelling, spending time with her family, and working in her yard at her acreage. Christina joined our front office staff in 2009, after being a part of our cleaning staff. She grew up in Leduc and is proud to call it home for her family now. As a busy mother of three boys, they keep her and her husband running with all of their activities and sports. When they get a chance to relax, they enjoy camping, boating and quadding. Christina has always had a big heart for animals since she was a child. 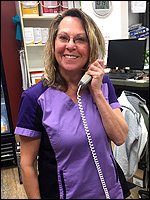 Lynne is one of the friendly faces that greets you at our reception desk or on the phone. 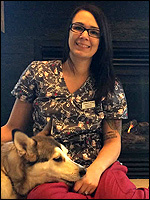 She has been a receptionist at Leduc Veterinary Hospital, and now The Farm Animal Hospital since 2000. She was raised in the Edmonton area and now lives near the town of Beaumont with her husband. In her spare time, she enjoys traveling, sports, the outdoors, and spending time with her family and friends; especially her grandchildren. Amber manages inventory and has been a member of our team since May 2007. 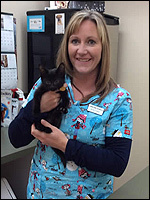 Amber comes to The Farm Animal Hospital with many years of experience in inventory control. In her spare time she enjoys family time with her husband and two sons as they like to escape to the mountains every chance they get. In the summer, when she's not working, she can be found at the family cabin at Wizard Lake.